Looking for some late-night Branson entertainment? Join us for our Friday night 10:30 PM show! Co-hosted by Grand Country nuts, Jamie Haage as Jim Dandy, and Mike Patrick, this show features a rotating roster of special guest stars from the rich Branson entertainment industry. From celebrities such as Mickey Gilley and the Oak Ridge Boys to the up-and-coming stars of tomorrow, the weekly line-up is always a hit! Audiences also enjoy the incredible voices of Jackie Brown, Melody Hart and the powerful harmonies of New South, all weekly regulars on the show. The entire show is backed by the dynamic Grand Band. Branson Country USA is also broadcast on radio and television stations around the country. This includes local stations: KRZK –106.3 FM, in Branson, Missouri, KHBZ – 102.9 FM, in Harrison, Arkansas, and KOZL-27 TV, in Springfield, Missouri. Be a part of the studio audience! The show can also be downloaded as a podcast, via the internet at www.iTunes.com. When the red “ON AIR” light comes on, it’s sure to be a GRAND time! 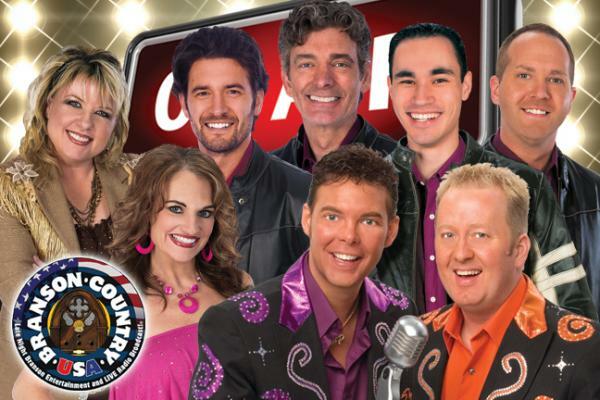 Branson Country USA is performed every Friday night at 10:30 p.m., January - December, only at Grand Country Music Hall.